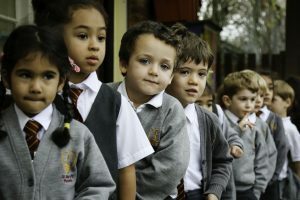 At St. Mary’s Church of England Primary School all of our children are part of a family group. These are vertical groups made up with children from our Nursery through to Year 6. The children stay in the same family group throughout their school life here at St. Mary’s. Our family groups ensure a close bond between other members of the same group and the members of staff who are attached. These family points are collected in class and contribute to points for the whole family group. At the end of the school week the family points are counted for each family group from each class and the totals are announced in assembly. At the end of each school term the number of family bubbles for each family group is then counted and the overall winners are awarded the family cup and receive an end of term treat! At St. Mary’s Church of England Primary School our Year 6 children are given the prestigious responsibility of being ‘family captains’. Family captains are selected based upon their merits and what the individual will gain from their role. Each family group has 2 family captains: 1 boy captain and 1 girl captain. Sports provide an opportunity for friendly competition between each of our family groups. In particular, our annual sports days will see each of our family groups compete in various events to accumulate family points. The overall winners on the day are awarded the sports family cup.